The Aditya Birla Fashion and Retail Ltd (ABFRL) stock hit a new 52-week high last week. The stock has gained 17% in the past two-and-a-half months as the company demonstrated better profitability in its premium brands business and laid down a growth trajectory for the value fashion business—Pantaloons. The gains were further accentuated by the government’s decision to charge goods and service tax (GST) of 5% for apparel priced below Rs1,000 and 12% beyond that. The rates are not as bad as feared. This helps ABFRL in two ways. One, as Ambit Capital Pvt. Ltd calculations show, net of input tax credit, the proposed tax rate works out to be lower than the existing tax rate for ABFRL. The low rate will aid the value fashion business segment, Pantaloons. The second factor is the transformation in the value fashion business. As in the case of several other industries, GST is expected to help strengthen companies in the formal sector such as ABFRL. Increased compliance is estimated to reduce the cost arbitrage between the formal and informal sector, benefiting the former. “In apparel, GST brings the entire chain in the tax net, lessening evasion of both direct and indirect taxes. GST will also make value fashion (priced below Rs1,000) retailers such as Trent and Pantaloons more indirect tax-efficient," Ambit Capital adds. If the tax benefits pan out as expected, then ABFRL’s efforts to strengthen Pantaloons’ market position through cost competitive products will get a fillip. The company is trying to improve Pantaloons’ market position through greater reach, competitive pricing and better product cycles. It reduced prices last fiscal. As the strategy drives volume, ABFRL aims to improve profitability at Pantaloons. That said, for the benefits to be reflected in ABFRL’s earnings, two factors should work in its favour. One is pricing. The rush to pare inventories ahead of the GST implementation through promotional offers can weigh on realizations in the current quarter. The other factor is the steady or continued recovery in the brands business. 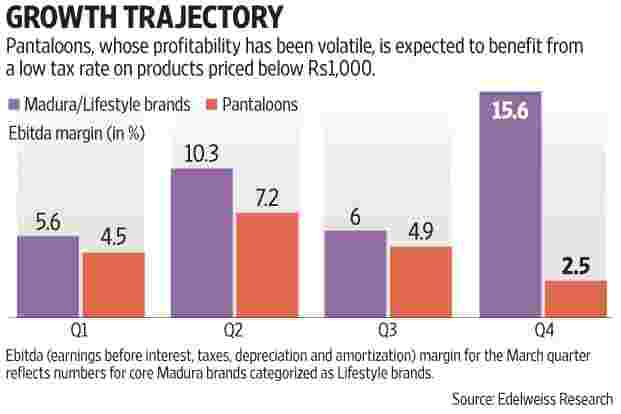 Its lifestyle products division, which constitutes premium brands (priced higher than Pantaloons) and generates more than half of ABFRL’s revenues, is coming out of restructuring or the revamp mode. As costs were reduced, profitability at the business improved. This helped ABFRL overcome the drop in profitability at Pantaloons in the March quarter. To recap, Pantaloons performance in the past quarter was impacted by store closures and prolonged end-of-the-season sales. But as business stabilizes and new stores add to sales, Pantaloons is expected to see improvement in profitability this fiscal. “Pantaloons is a turnaround story and expected to sustain its robust run and gradual margin improvement," Edelweiss Securities Ltd said in a note last month. While these expectations are driving up the stock, an improvement in profitability (both at Pantaloons and ABFRL) will be crucial for the sustainability of the stock’s outperformance.